This topic could be placed in a number of mathematical categories (numbers, linear algebra, matrices, calculus, and others). 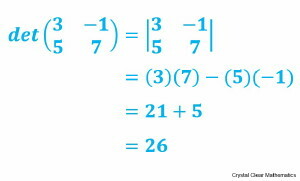 I toyed with listing it in the [Algebra] section of this website, because determinants were first created as a method for rapidly solving simultaneous linear equations. 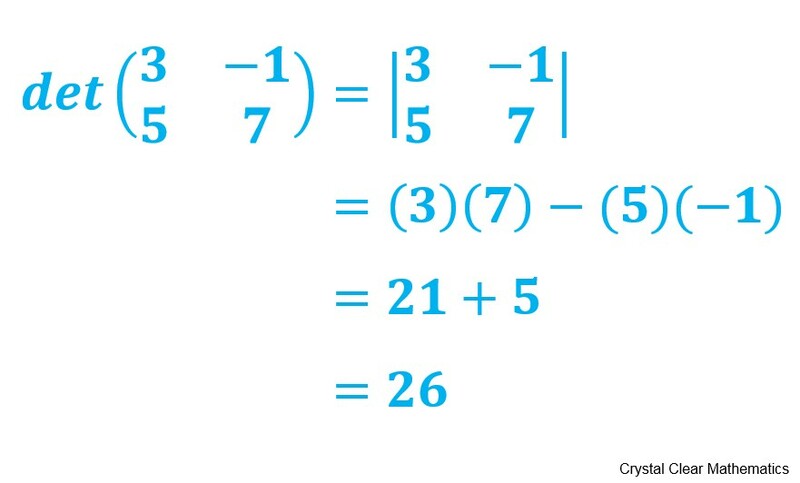 Once mathematicans realised that they were really numbers, however, they became curious about their properties … how to add, subtract, multiply and divide them (and more). So, that is why you find them here, among the numbers. You can see, from the illustration to the left, that the determinant of the 2×2 matrix (represented with parentheses) is written using the same array of numbers with a vertical line on either side. For a 2×2 matrix, the determinant is calculated (evaluated) by multiplying the numbers on the leading diagonal (3)(7) and subtracting the product of the remaining numbers on the other diagonal (5)(-1). As you can see, this results in a single number. Why are they used, what are they useful for, and how they are manipulated will be revealed on this page in time. I will also be sharing about the history of linear equations, matrices and determinants. I was going to provide a link to a useful site for you to use in the meantime, but I cannot find a site that starts from the basic properties of an array of linear equations. I believe in starting with such an array and then deducing the concepts of matrix multiplication, inverse matrices, transposed matrices, and determinants. Please be patient.